Landing in Buenos Aires after my 11 hour direct flight from Johannesburg, I was a little nervous. I had no Argentinian Pesos and all the ATM’s at the airport were out of cash. Even the highly expensive money changers at the airport were not working on a Sunday evening. Fortunately, the company that provides a bus shuttle to the city accepts credit cards, and I was able to purchase a ticket – although the official exchange rate is less than favorable. In Argentina, there are 2 exchange rates for the dollar. The official government rate for USD 1 when I arrived was 6.44. However, there is a black market / Blue Dollar market rate which offers much more: See http://dolarblue.net/ for the latest rate. The unofficial but true rate of inflation in Argentina is approximately 25%. Residents feel safer saving in US Dollars rather than the Argentinian peso but the government has banned residents from saving in USD. If a resident of Argentina wants to travel abroad, after much paperwork they can get a few dollars from their reserve bank – however, from what I understand, what they receive is barely enough to pay for a train ticket. If Argentinians swipe their credit card abroad they pay the official dollar rate + 35%. However, they cannot draw cash from a foreign ATM, and have to turn to the black market for USD bills. Manuel Tienda Leon transported me to their main bus terminal in town, where I transferred to a smaller van that dropped me of at my accommodation, Estoril Terrazas, a charming 100+ year old building on Av de Mayo. After leaving my luggage, I headed off to Florida street, the place you need to go to change your USD for AR$. Although the sun is still up at 9 pm, most of the shops were closed. I still had no local cash on me. Luckily I prepared and brought some bottled still water and snacks from Johannesburg. At dinner time I found a nice restaurant serving pizza and other dishes that accepted my credit card for payment. Note: In Argentina, they normally eat dinner after 10 pm. Before 10 pm restaurants may serve snacks only. That night I spent some time taking pictures from the roof of Estoril Terrazas and made friends with other foreigners staying in the building. 2 Americans, a German, Finnish and Argentinian. By midnight (which was 5 am South African time) I had to turn in to bed. The next morning I was up before 6 am, thanks to some jet lag. After taking a shower I decided to take a nap again until 10:30 am and then have breakfast. While eating breakfast 2 Argentinians walked up to the table and said they are offering a free historical walking tour of the city, leaving in 10 minutes. If I want to join I should just come downstairs. The Finnish (who was also at breakfast) was departing for Uruguay in 10 minutes by ferry and could not make the tour, but the German and I decided to go. We went down and met up with an American (from Las Vegas) a Swede and 2 others. The guides were good and gave us good insight into the history of Argentina, the various revolutions, and interesting monuments. Argentina comes from the word “Silver”. There is no silver in Argentina, but it was given this name because it was thought that the country had silver. Instead, silver was found on the plains of Bolivia and then transported to the port at Buenos Aires to be shipped away to Europe. We visited the site of the first university and church in the city. While walking outside we heard some really loud blasts – this was from one of 3 demonstrations I saw during the day. Apparently it’s normal for demonstrators to light up loud fireworks during a demo. We then headed off to Plaza de Maya and visited the Metropolitan church. On the right aisle on the border of the church lies General San Martin’s remains, which were shipped to Argentina from France (where he died). 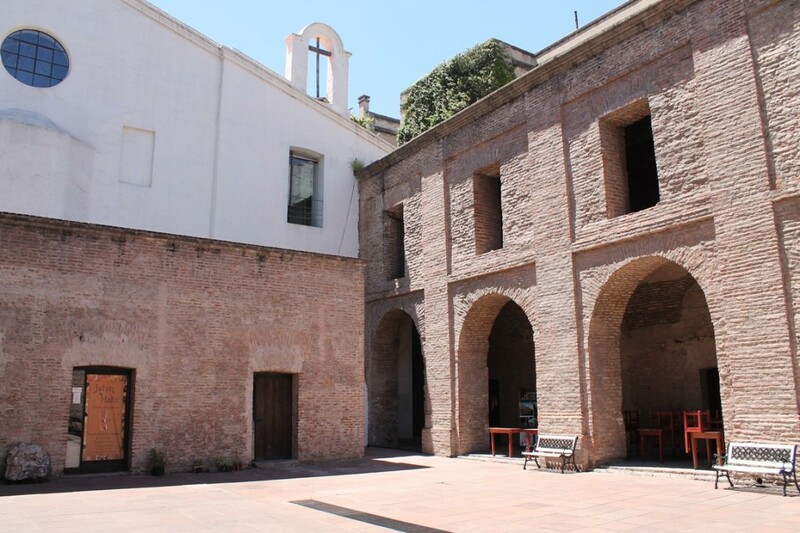 San Martin played a significant role in Argentina’s history in the 19th century, and the government wanted him to be buried in Buenos Aires, but because he was a Free Mason, not a Christian, the church only allowed him to be buried on the border of the museum. Our guide advised that he may be buried upside down, facing the ground or hell as the church may hope, but I am not sure how true that story is. Surrounding Plaza the Mayo is the Governors house, Tax Authority, Secretariat of Intelligence, City Hall and the Pink House, where the president resides. This makes Plaza de Mayo a central spot for protesting. Why is the president’s house referred to as the Pink House? Because the first time it was painted, they mixed cow blood, fat and white paint to produce the strong pink paint to cover the house. Nowadays they just use regular paint without the blood. The president was not at home when I was there. You know that she is home when there are 2 flags of Argentina raised on the premises. There are free walking tours of the Pink House on weekends and Public Holidays. Back in the day, Evita used to stand on the balcony and speak to the people. Between 1976 and 1983, South America’s darkest period took place, referred to as the Dirty War, where 30000 citizens went missing under dictatorial rule. The “Mothers of the Plaza de Mayo” were an organisation that was formed subsequently to find out what happened to their children or relatives. Every Wednesday they still come to Plaza de Mayo in remembrance of their lost ones. The figures on the ground represent the mothers walking around with white nappies on their heads. There is a lot of history regarding coups, tragedies and revolutions in Buenos Aires, too much for me to get into detail about. The walking tour was definitely insightful. I then decided that I need to get some local cash. The Swedish girl in my walking tour group just exchanged her dollars that morning at AR$9.4o to a USD. I took a picture of the business card of the exchange she used. and decided to use them as well. The guide also gave me some tips on how to identify counterfeit bills that morning. On Florida avenue, there are money changers calling out “Cambio” every 10 meters. You can change with these guys, but their is a risk of getting counterfeit money. I went to the exchange that I was referred to and managed to get AR$ 9.45 to a USD. Far better than what the official government rate is: AR$6.44. Now that I had some money,it was time for lunch. I walked pass Galleria Pacifico and decided to check out their food court. I found a nice vegetarian restaurant, and had a good meal at Green & Co.
After lunch I walked around the city for 2 or 3 more hours, but at 36 degrees Celsius I decided to turn in at my accommodation. 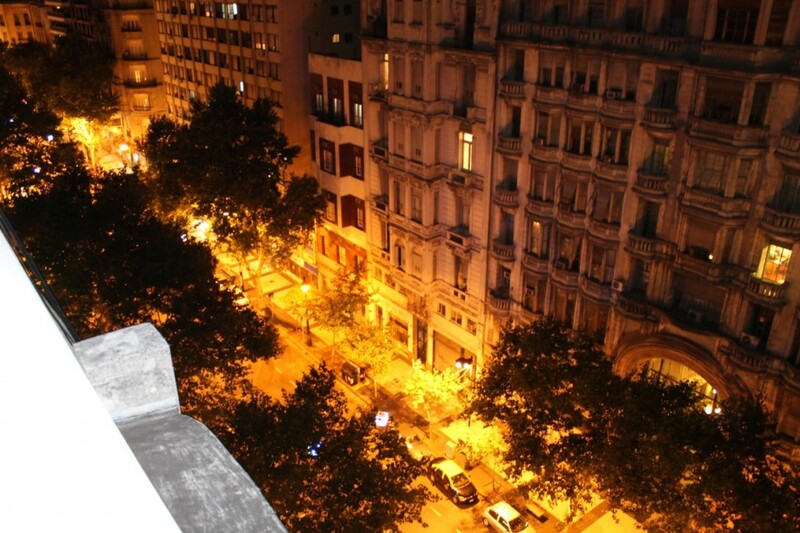 Buenos Aires feels a little like Rome, Naples and Casablanca. Tall concrete buildings in a grid layout, wide roads and pedestrian walks and lots of green zones scattered throughout the city. I woke up at 11 pm and had a nice chat with other guests at Estoril Terrazas. I managed to get good info on the other destinations that I plan to visit on this trip (Calafate, El Chalten, Torres Del Paine, Puerto Natales, etc) and learned more about their cultures. Around 1:30 am I was feeling hungry. The German and I decided to go out and get some food. We took a taxi to a place that he previously ate at, but they were about to close when we reached there. We decided to walk back and see what else was open (approximately 30 minutes walk). We ended up at a restaurant almost across the road from where we were staying at 2:15 am. I decided to get a Pizza Napolitana and he a burger. When we left just after 3 am, people were still arriving for dinner. Dinner is served late in Buenos Aires! After breakfast the next morning I decided to go back to bed till about 1 pm. It was over 35 degrees Celsius outside and I was a bit tired from the late night out. When I got out at 2:30 pm I realised that many shops were closed, as it is Christmas Eve. I went back to the vegetarian place I at in Galleria Pacifico the previous day but when it came to ordering, the cashier was unwilling to accept my AR$ 100 peso bill. She just said “No Cambio” (no change). Apparently, Argentinians don’t like dealing with the 100 peso bill and want smaller change. 100 pesos is equivalent to about $11 or ZAR 120 but they still consider this a lot of money. I decided to go to a Burger King and ordered a Sojo Gourmet burger instead. They were happy to accept my AR$ 100 bill and gladly gave me change. Note: When you exchange currency in Argentina, request “Viente (20) or Cinquenta (50) peso” notes. Tonight I leave for the airport around midnight (if I can get on the last Manuel Tienda Leon shuttle) or by taxi a little later for my 5 am flight to Ushuaia. It may be a bit hard to find transport on Christmas day, but I will figure it out late. I just plan to chill out at Estoril Terraza until then. Buenos Aires is just the sort of destination I enjoy exploring. You can’t take simple things for granted and need to learn the basics to get around in this foreign, non-English speaking land. The perfect start to a new adventure, and a great opportunity for new friendships. Thanks for the interesting read. Would you recommend Buenos Aires for couples with kids (3 to 5 year olds)? I’m not too sure if it’ kid friendly. It’s a large metropolis, which requires lots of walking. t the moment there is a the wave in the city. The beach is pretty small – people go to a beach resort in nearby Uruguay instead. Hi! I’m from Buenos Aires and I think he has not done much in the city. There are so many things to do, and beyond being a huge city has a lot to do, even for the kids. Regarding the beach, Uruguay is an option, but our beach is on the Atlantic coast, with Mar del Plata as the most important summer holiday period. Regards. Hi Angel. That’s very true. This article was my initial impressions from being in the city for 2 days only.